This unique appetizer is sure to have your party guests talking. Made by filling the bodies of squid with ground pork that has been seasoned with Thai herbs and spices, they are grilled and then sliced, making neat little 'squid sausages' to be eaten with wood sticks. Served at room temperature, you can make them up well ahead of time and just sit out before your party starts. The sauce is quite spicy, but the squid is not spicy at all, making them acceptable to people who lean either way. Finally you can serve something very delicious that most people have never even seen. Try them, you'll be happy you did. 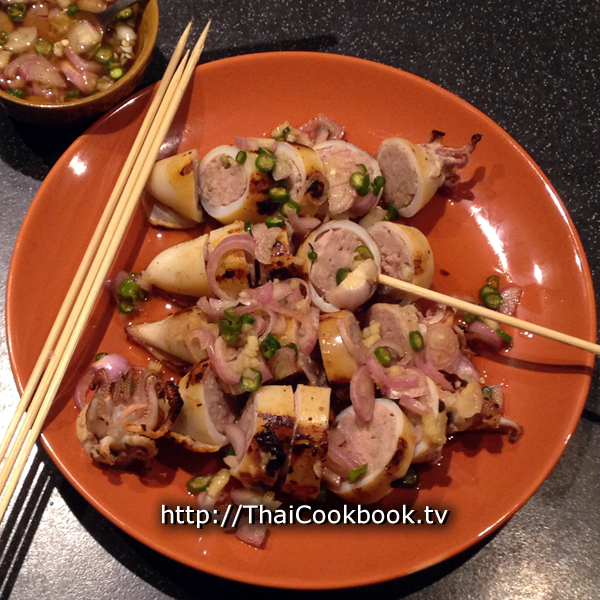 What's in our Spicy Grilled Squid with Pork Filling. 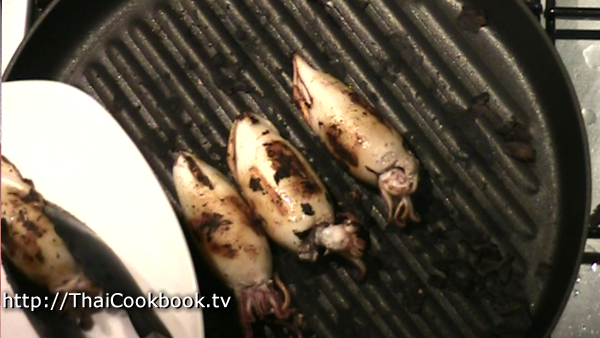 How we make our Spicy Grilled Squid with Pork Filling. 1) Clean the inside of the squid bodies well by washing them under running water, then marinate for 20 minutes in lime juice. 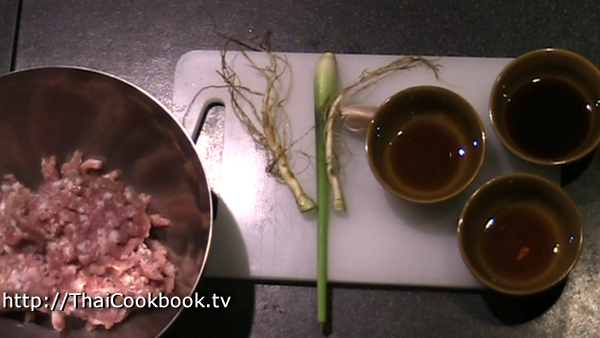 2) Chop the lemongrass, garlic, and coriander roots very fine. 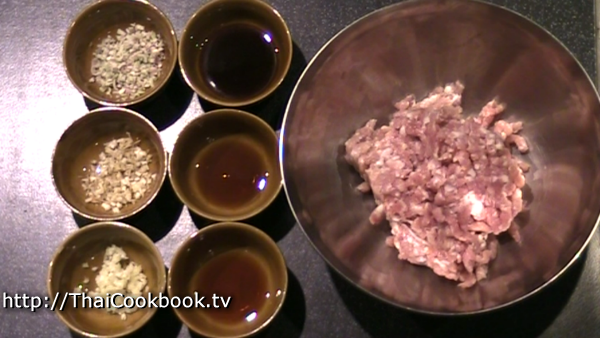 3) Mix the chopped meat with the herbs, sauces and spices. 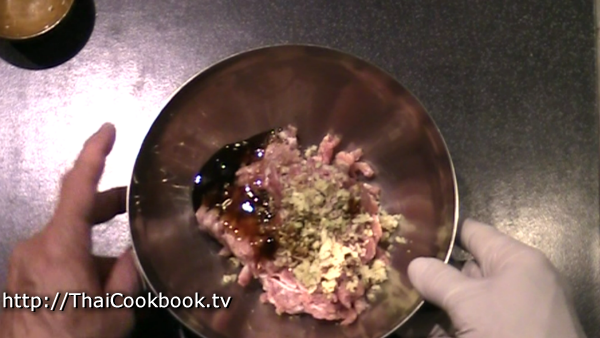 4) Stuff the meat mixture into the squid body, the reattach the head with a toothpick. 5) Grill or barbecue for 20 minutes. 6) Let cool and slice into 1 inch pieces. Serve with spicy dipping sauce. 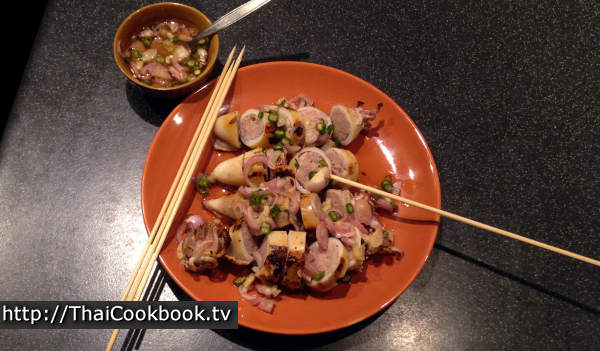 When you select the squid for this recipe, take some that are on the smaller side. 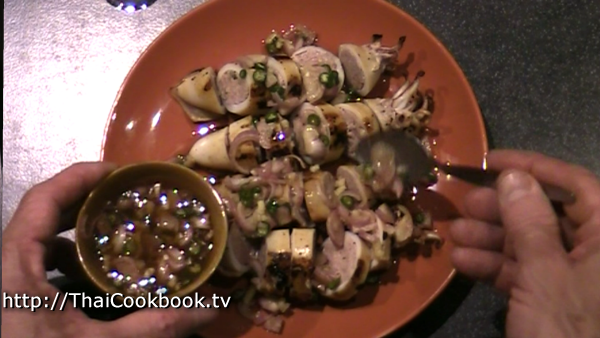 You do not want really big squid, as the filling will take too long to fully cook. 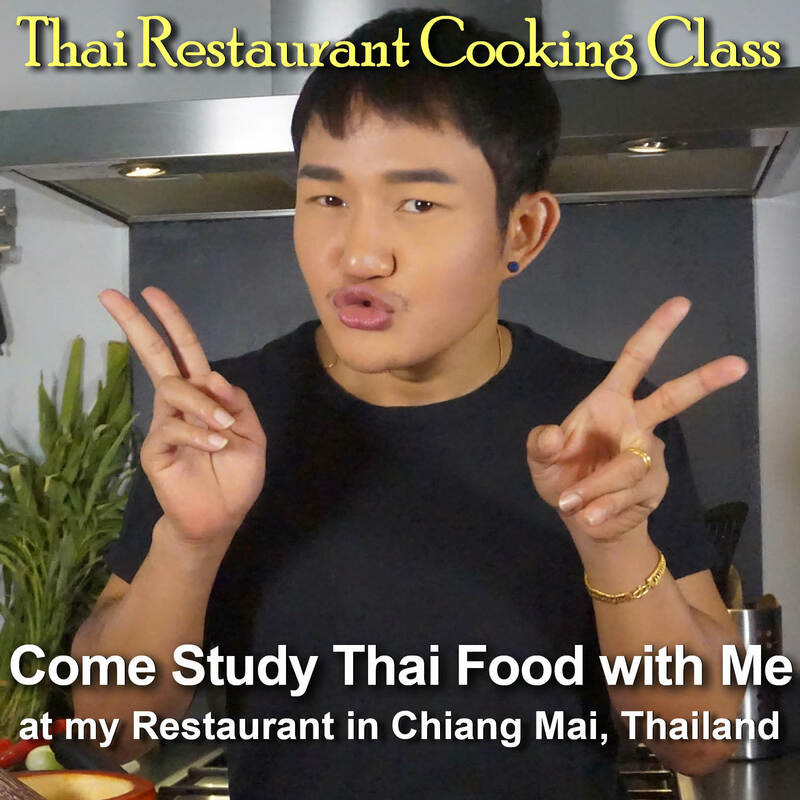 Remove the heads from the squid, and clean the intestines from the body cavity. Wash everything out really well under running water. Be sure to remove the cartilage from the top of the squid back. 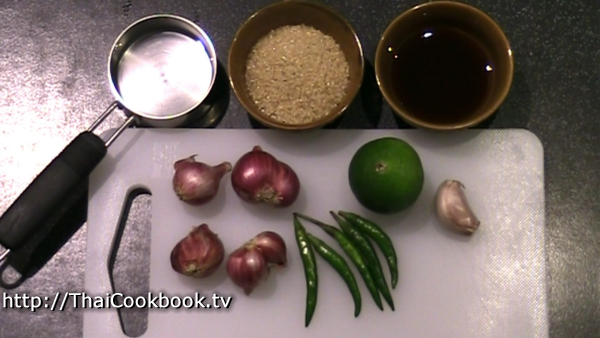 Marinate the squid in one Tablespoon of lime juice for 15 - 20 minutes. While marinating the squid, prepare the filling. 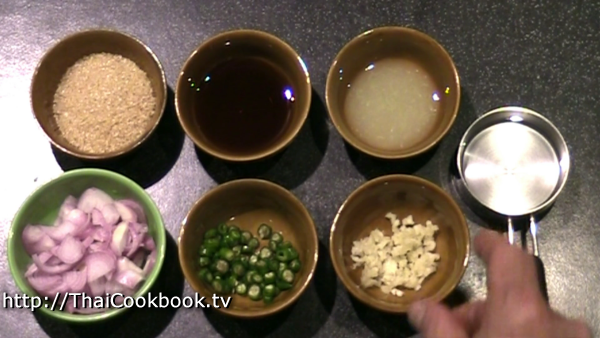 Measure the oyster sauce, light soy sauce, and fish sauce, and have them ready. 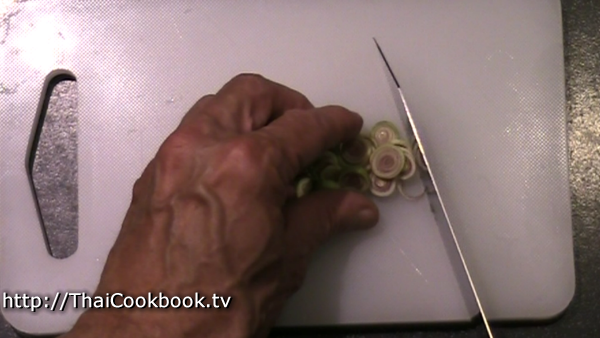 Slice the bottom half of one stalk of lemongrass, and then chop it very fine. Clean the small roots away from the coriander roots and discard them, then wash the main root really well. Chop them up very fine. Clean and then chop the garlic very fine. Mix everything into the pork well. Stuff the filling into the body of the squid, using a spoon, your fingers, or whatever way you can do it. 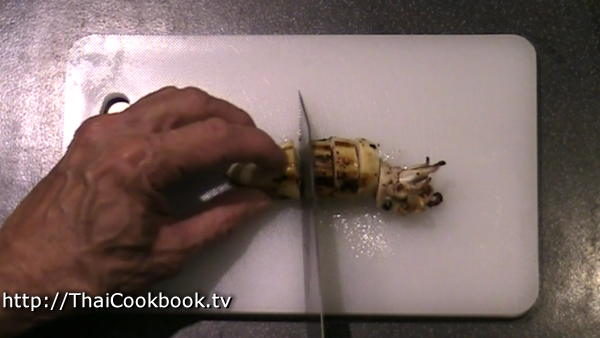 Use a toothpick to secure the squid head to the body, sealing off the filling inside. Do all of your squid the same way before you start cooking them. I used a grill pan on my stove top, but a barbecue also works out very well. Just be sure it is not too hot or they'll burn up before the meat inside is done. Grill the squid on all sides, turning often, for about 15 minutes. 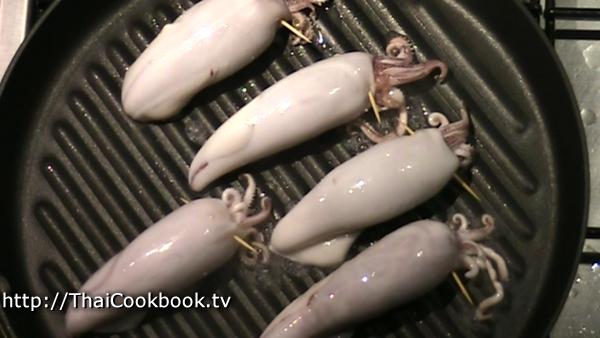 The exact amount of time depends on how big the squid are, and how tightly packed the meat filling is. You should take one off and check it to be sure the meat inside is not still pink. 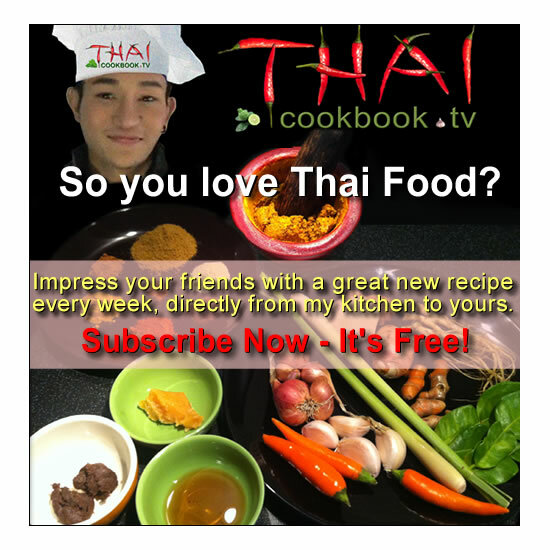 While the squid are cooking, you should have time to make the spicy seafood sauce. If you think it's easier, just make this ahead of time. It doesn't stay fresh for long so should be made just before. 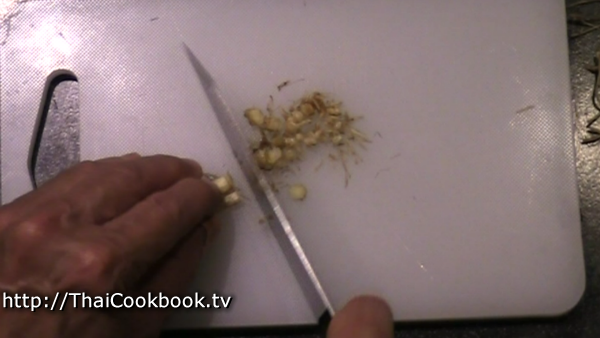 Peel the shallots and cut them in half, then slice them very thin. Cut some Thai hot chilies very small. Green or red chilies are fine. Chop the garlic very fine. Squeeze the juice from about 2 limes. Heat the water in a small saucepan. Stir in the sugar and let it dissolve. 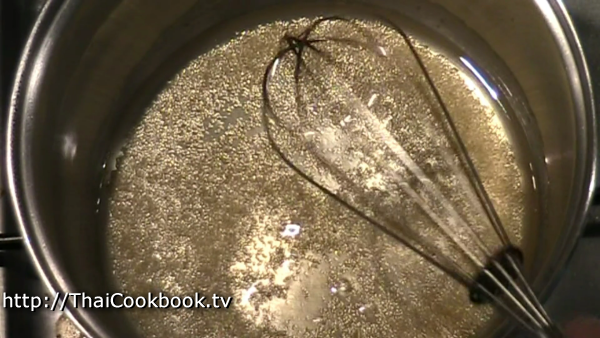 You do not need to boil the water, just get it hot enough to melt the sugar. Pour the sugar water in a nice bowl for serving. Add the rest of the ingredients and stir a little. Let sit for 15 minutes before serving the squid. If you're serving later, store in the refrigerator. This relish does not last long at room temperature. By now the squid should be done, but be sure to check the filling. They might get burned a little on the outside, but don't worry about that. Just wipe off the burned parts. Take them off the heat and let them cool. 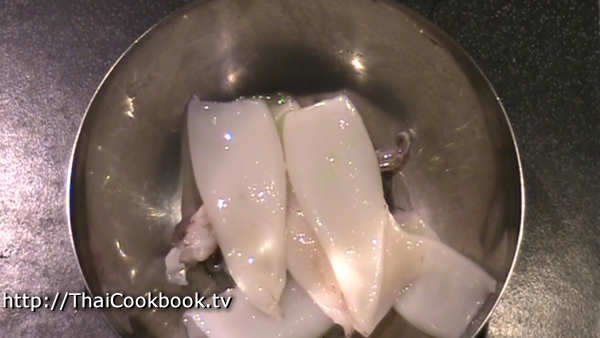 After cooling, slice the squid into 1/2 inch slices. Serve on a nice plate or platter to be shared at the table or as a party appetizer. If you're sure everyone likes spicy foods, go ahead and put some of the spicy seafood relish over the squid. Otherwise serve it on the side as an option. Provide wood skewers (hot dog sticks) or toothpick for your guests to eat with.